Core Brand for Sewing "HIROSE HOOK"
Ultimate precision “craftsman” skill – excellent accuracy &, quality praised by sewing machine makers across the world. Hirose Hook's wide line-up assure to support the diversified sewing technology required by the customers. Line-up of Hirose Hooks extends to over 1,000 kinds and we are enjoying the fullest confidence from every user in the apparel industry as world top hook maker thanks to the superior technology & quality accumulated throughout history. As well as Sewing Machine being indispensable for Apparel industry, Hirose Hook is also so important component as being called as “Heart of Sewing Machine”. 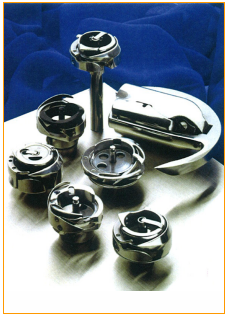 Hook quality significantly affects on the performance of Sewing Machine. To realize the high & diversified quality required from customers, we are tackling day after day to develop and produce New products and to enhance quality control. By employing in-house-developped instrument and equipment, it comes true to comply flexibly with the delicate adjustments for the products & the specification change and also, to attain the integrated quality control. As most outstanding feature, we are proud of the accumulation of technology and know-how cultivated over many years. Pursuing high quality products thoroughly by mass of well-trained workers being called as “skilled craftsman” is alive on Hirose Hooks one by one.